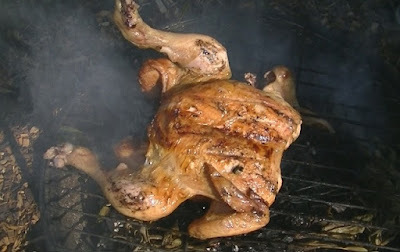 The sage smoke from the barbecue gently permeates the chicken giving it a subtle sage flavour. I like to spatchcock the chicken which makes the chicken cook a little quicker and it really lets the smoke get right up through the cavity of the bird. I detail how to spatchcock (sometimes known as butterflying) the chicken in the video, It's quite simple, you just have to cut out the backbone out with a pair of sharp kitchen scissors. The recipe uses a lot of sage (an armful) for the sage bed, you really need access to a sage bush, those little bags of herbs you buy at the supermarket won't come anywhere near close to being enough. Add the sage to the coals once they are white and there are no flames, you want smoked sage flavour not a barbecue full of sage on fire. Cover the chicken and smoke it for an hour turning it in once. This smoking technique is great when you have a herb bush needing a trim. Rosemary and bay smoked ribs are also popular fixture on our barbecue. What's your favourite meat and herb combination?